Thirteen year-old Harry Potter has reluctantly spent yet another summer with the Dursleys, his dismal relatives, "behaving himself" and not practicing any magic. That is, until Uncle Vernon's bullying sister, Aunt Marge, comes to visit. Aunt Marge has always been particularly horrible to Harry and this time pushes him so far that he "accidentally" causes her to inflate like a monstrous balloon and drift away! Fearing punishment from his Aunt and Uncle--and repercussions from Hogwarts and the Ministry of Magic, which strictly forbids students from using magic in the non-magic world--Harry escapes into the night. 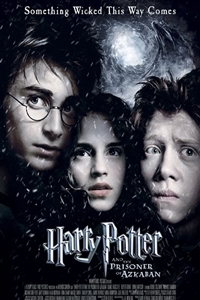 Along the way, Harry will try to make sense of Hermione's puzzling appearances and disappearances, with the help of Ron and the giant Hagrid, who has taken on a new position at Hogwarts as the Care of Magical Creatures teacher. A confrontation between Harry and the menacing Sirius Black seems inevitable, but what exactly is Professor Lupin's relationship with Black? What is the dark secret that Professor Snape is so eager to reveal? And just why is Ron's pet rat Scabbers so frantic to escape his grasp? Harry will need all of the courage, magic and support he can muster to answer these questions and uncover the truth behind Sirius Black and his ties to the gifted young wizard's mysterious past.